Citizen Con Livestream is around the corner and we have a new Sale up for the Polaris Corvette. I've added one to my fleet. With all those features it seems like a mix of all hopes and dreams that were put into it. Compared to the Idris it still needs a pretty large crew though. Really good looking ship so I'll pick one up, but I'll be melting the Caterpillar, 350R, Freelancer and the Sabre for it when they open this up to the general public since they aren't allowing store credits with the pre-sale. I'm pretty much in the same boat. I like how it looks as it really does resemble a human take on a Kilrathi corvette. I'll decide what I melt after I see what else they have for sale (hoping for the Hoplite) and if they offer CCUs or not. Of course they'd drop this on the weekend I'm short. And without store credit to boot. I guess they're going to do limited release too? No limit on the ship quantities and it will be available until the 17th, so plenty of time to grab one. It is done. The Ultimate Armada Package has been mostly completed. All that's left is to upgrade the Warden into a Hoplite or Harbinger and it's done. Very nice Kamikazi, I think the package is now truly worthy of the name Armada Package when you have the Polaris and Idris in the same pack. Thought about melting almost everything I have to get a Polaris but stopped myself from an impulse buy lol. Instead I got the Aggressor pack for the discount from which Ill probably do some upgrades. Will probably swap the Buccaneer into either an F7C or an F7C-M (the lack of an ejection seat and durability in the Buc is a bit of a sticking point for me), debating upgrading the Cutlass to the Freelancer but not as sure there may wait on the redesign of the Cutlass for that, and Ill probably upgrade one of the two Dragonfly's into...something - dont have much use for two of them but Ill probably only have 20-30 of credit left plus the $35 for the Dragonfly means it has to be something small. I can tell you that being there is a completely different experience than watching the stream. I highly recommend you try to go to one of the events, wouldn't trade the experience for anything! 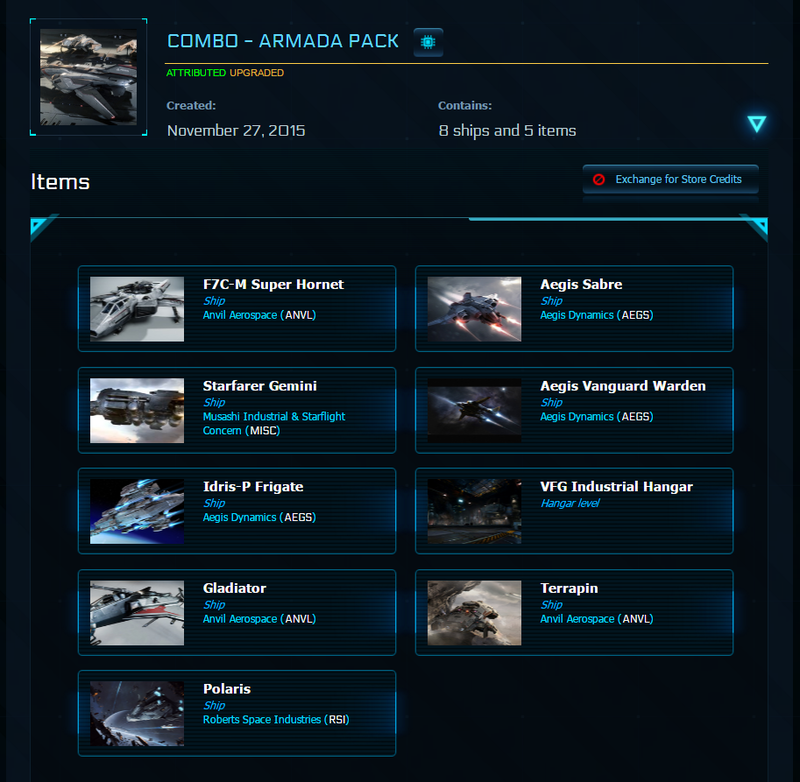 I'm waffling between upgrading my Retaliator in my Armada package to the Polaris and just out-right buying the Subscriber/Concierge/CitCon attendee discounted version with the special unique serial number. I suppose I can always wait until the second QA comm-link is released but just seeing what y'all's opinions are. To me the Polaris is just a bigger and more advanced Retaliator. It has a lot more torpedoes, and gun and missile turrets that can not only target individual smaller ships but they can be laid to bare on capital ships too. The Polaris is definitely an anti-capital ship with the multitude of torpedoes that the ship can house (and 4 torpedo tubes...). Only downside is the crew requirement (no worse than my Idris though). I know I can get an NPC crew but the cost of that and the upkeep of the ship itself.....looks like a fairly big credit sink. If I don't go down that route, I can always spend the $625 to get the "special" Polaris but then that would leave me with a tight budget for the remainder of the month.....decisions.....decisions! If your only melting the Retalliator then your not really saving all that much so if it was me I'd just take advantage of the discount and purchase the ship outright. Additional you get the numbered version of the ship and I believe a hard copy of the brochure for your coffee table which is a nice touch.